For those that read my blog regularly, it is no surprise by now that the only thing I love more than a great children's book... is a great INTERACTIVE children's book. Even as an avid reader as a child, I remember being drawn to these myself. I would have read the books anyway, but having that extra element of fun made them even better. For kids who aren't as big of readers as my childhood self or my book loving son, they sometimes need that little extra element to make reading fun. Interactive books take reading from something that kids HAVE to do, and instead something they look forward to. When it comes to Bible stories, what could be greater than a book that kids truly want to open up and explore? What’s better than a favorite Bible story? Two favorite Bible stories! Learn about how God created everything, and then flip the book over and learn about Noah and the flood! 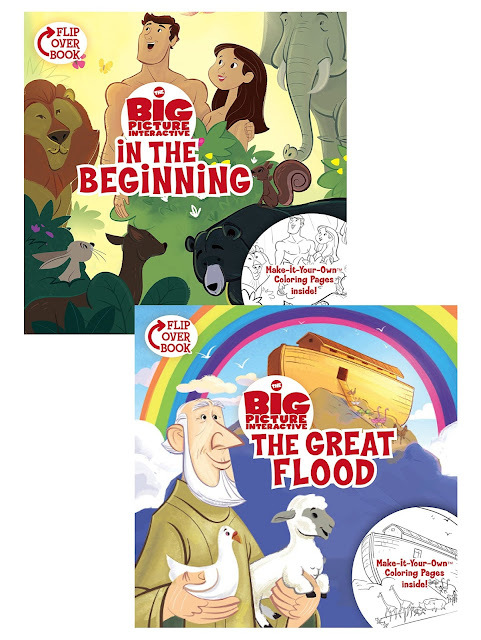 These Big Picture Interactive Flip-Over books offer coloring fun as well, so you can make the story your own. These happen to be two of my son's favorite Bible stories, so of course, he loved it right off. I don't know what makes the idea of a flip book much more appealing than two separate books, but whatever the case, he loved it. But we'd had other flip books in the past, so what set this one apart and made it even more interactive? The coloring! Now, my son actually isn't much of a colorer, but most kids- my daughter included- love coloring, right? This drew her in. She's actually the one in my household that doesn't particularly care to sit and be read to, so that little extra motivation was a plus. She loved coloring as we read the story...and then her own works of art becoming part of the experience as we read it again! Much in the same way that I find I absorb Bible stories better when I'm creating art in my journal, this book gives kids that experience that will help them to also retain those stories a little better than strictly reading it through again and again. When they experience it, they take it in. Even with something so simple as coloring in a few graphics! If you're looking for a fun way to have your little ones read AND enjoy their Bible, this is certainly one worth checking out! It is available to purchase now. Love love love it!! They look fantastic! So funny and love it. Thanks for share!! Great books and they would make perfect holiday gifts!! ...my neighbor needs to know about this for her grandkids! ha ha ha So funny and love it. Thanks for share! !